Red's Shoe Diaries: Spot On! If you were to ask me about my favorite patterns or prints, I'd be quick to tick off stripes, plaid, and paisley. Polka dots probably wouldn't make the list. Yet, it's recently occurred to me that I have a lot of polka dots in my closet. In fact, I actually can't remember a time that I didn't own at least one polka dot dress. It's a timeless and peppy pattern, especially for Spring and Summer. This navy and white dress from my go-to local boutique, Enza's, is my current favorite (see my prior post about this gem of a store here). 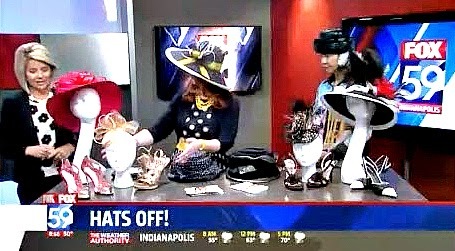 The knife pleated fabric with its large, but subtle, sheer tone on tone circles beneath the traditional white dotted pattern is unique, and it was an obvious choice for a recent local news appearance to promote the IMA's upcoming Hat Over Heels luncheon. I knew I wanted to wear something local, and I also wanted to sport a bit of blue collar gold swagger in acknowledgment of the Pacers' playoff game the same day. This dress was "spot on" when accented with bright yellow vintage jewelry from the 50s and classic spectators (forever my favorite kind of shoe). Of course, a Hats Over Heels promotion wouldn't be complete without a hat, so I added yellow grosgrain ribbon to a wide brimmed, monogrammed navy and white Derby hat from Macy's to complete the coordinated look. If you're in the Indianapolis area, there's still time to get your tickets to the Hat Over Heels luncheon, which is just one week away. I'd love to see you there! For more outrageous, fun, and stylish hats, check out Style Crone's Hat Attack! Absolutely stunning! Love the polka dots and the yellow accents. You wear your hat with panache! Thank you for sharing with Hat Attack! Thank you. Your flowers are divine! Yellow and navy and polka dots? Yes, please! You look stunning! Thank you! You are truly a woman of style, so the compliment means a lot.